Last night, I had a wonderful time visiting with Michael Pollan, American author, journalist, activist, and professor of journalism at the UC Berkeley Graduate School of Journalism. 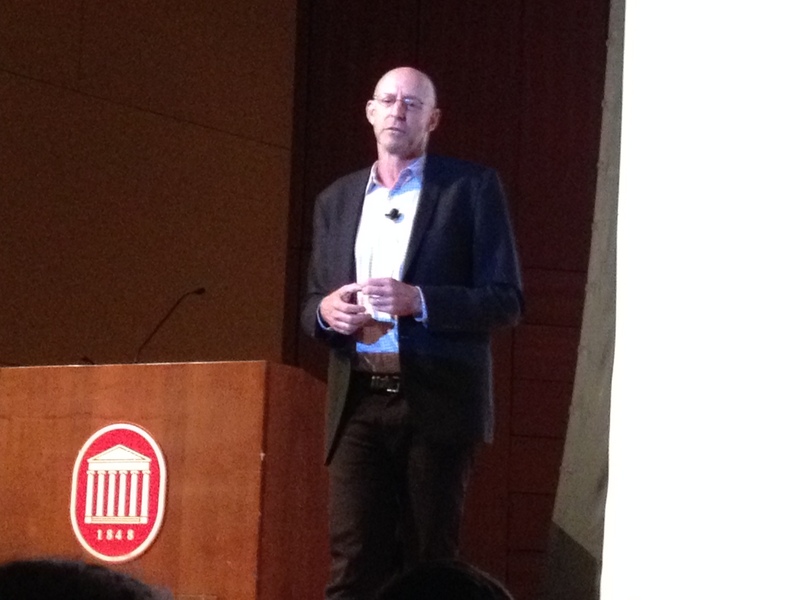 There also were about 600 other people in the room for “An Evening With Michael Pollan” in the Music Building at the University of Mississippi at Oxford. Judging by their rapt attention and applause, I’d say they had a splendid time, too! If you care about food (other than stuffing it in your mouth), its history, its social importance, and health effects, then Pollan is an expert worth heeding. The fact that his six books on the subject have all reached bestseller status is testimony that plenty of people are interested in heeding him. 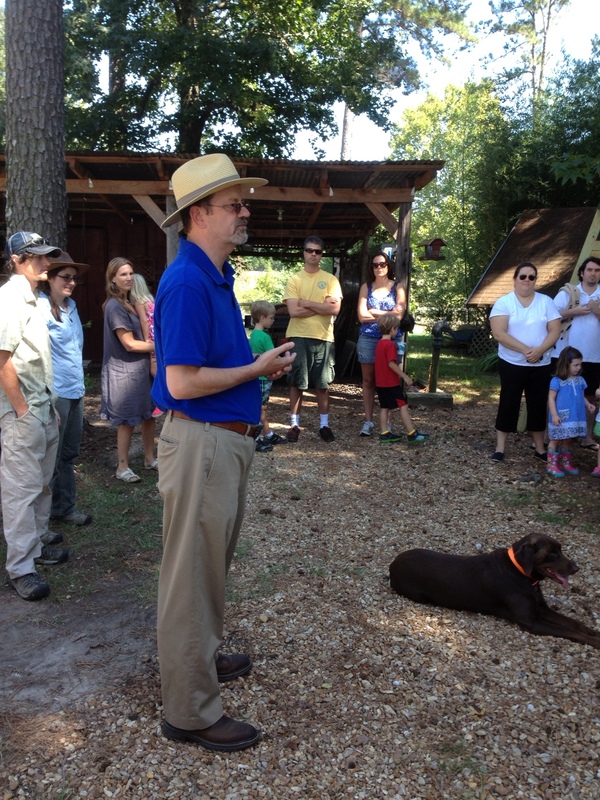 The event was sponsored by the Southern Foodways Alliance and Square Books of Oxford. Pollan’s latest book, Cooked: A Natural History of Transformation, has just come out in paperback and Pollan was on a book-signing tour. His talk, which lasted about 70 minutes, started out with background and stories from the gathering of information about the book. He regaled the audience with humorous stories about his immersion into the making of barbecue — and the audience laughed at his tales, which included pork aficionados’ crack-like desire for “skins” or crackling. The Southern Foodways Alliance had two short films that illustrated the cooking of pork and places featured in the book that were located in North Carolina. Pollans’ talk vaguely paralleled the layout of the book: Fire (barbecue); Water (soups); Air (bread); and Earth (fermentation). It’s a superlative book; but I’m not an impartial observer. I’m a big fan, and it really made my day to briefly chat with him afterward and give him a signed copy of my book, Conscious Food: Sustainable Growing: Spiritual Eating (Findhorn Press, 2012) while having him sign my copy of Cooked. Readers of my book, Conscious Food, will remember that a central question is: How did we become so distanced from the making and appreciation of our food, including its spiritual aspects? It’s a puzzling and disturbing quality of modern life, and Pollan also brought it up, saying that only a generation ago no one would have bought his books explaining where food came from because it was so tied to daily life. There would be no mystery, no question. Now, of course, that’s not so. In fact, as Pollan pointed out, there are laws being enacted and proposed to actually prevent people from seeing how food is made, making it a crime to photograph a slaughterhouse or chicken factory farm. The highly processed food we eat, composed of highly refined sugars, starches and carbohydrates often can only truly be called “food products” rather than food. That processed foods also almost certainly contain genetically modified organisms (GMOs) is also a cause for alarm among many. That’s how far we’ve come in making something which should be wholesome and good (making food) into something that is feared, insulated, even secretive. While Pollan seemed to get the most interest by the audience in his tales of making barbecue, he also explored the other foodstuffs in the book. He discussed the making of bread – not nearly enough in detail for my avid interest, of course. But he did point out in great detail how sourdough bread, and other fermented products such as cheese and krauts are healthful when done in traditional ways. Illustrating the benefits of probiotics (good bacteria versus bad bacteria) he told of one experiment that showed that raw milk processed into cheese in stainless steel vats and injected with e. coli became toxic while the same milk in reused wooden barrels did not because they contained accumulated beneficial bacteria that held the e. coli in check. So much for our theories of anti-bacterial cleaning! He even often insights that what we usually eat – for flavor, texture, etc. – is aimed at only 10 percent of us; the part that tastes food. Ninety percent of real food feeds the “gut” – the microorganisms that do the work of digestion, absorption of nutrients and health protection. Mother’s milk, he pointed out, is 100 percent food. A pizza or cheeseburger or “Supersized” cola would be 10 percent. Soups, he noted, extended the lifespans of humans since, generally, people lose teeth when they age; it allows nutrients to be obtained with a minimum of chewing. Taking a swipe at raw foods, he said that cooking unleashes myriad nutrients and chemically changes food; but he also said that raw food enthusiasts can obtain premium nutrients by processing their food with a mixer. I love my Vitamixer! I know I’m not doing him justice here. His talk was insightful, interesting and not only repeated some information in the book but provided his thinking behind it and revealed his zeal in pursuing and promoting a healthier society that exalts good food. He was singing my song, for sure! If he appears anywhere near you, and you care about these subjects, I’d highly recommend you go hear him and, of course, buy the book. The talk was three and a half hours away from me by car — I didn’t get back home until after midnight. But it was well worth it and I would certainly do so again! 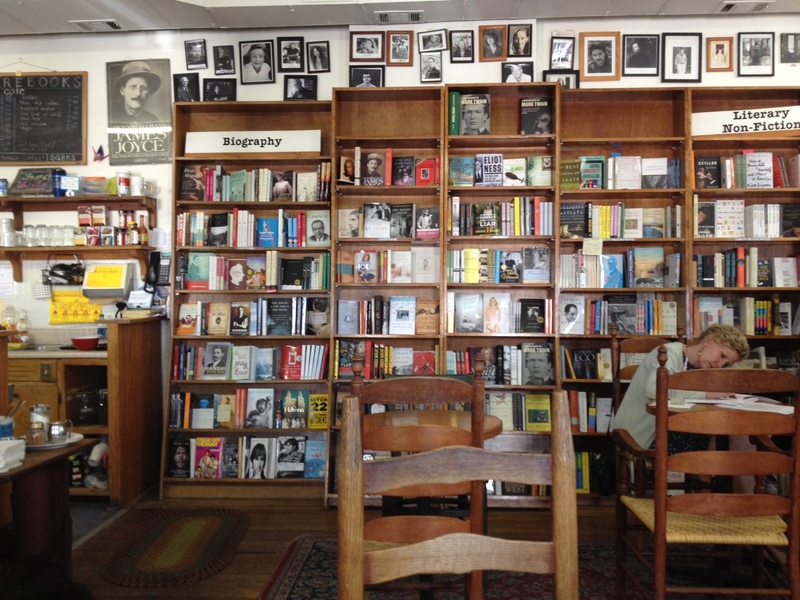 I also got to visit for a while beforehand at Square Books in the courthouse square in Oxford — one of my favorite independent bookstores. Naturally, I bought a couple of books while there and since I had a few moments before the talk started, I also had a cup of delicious fresh-brewed coffee and a couple of homemade cookies. 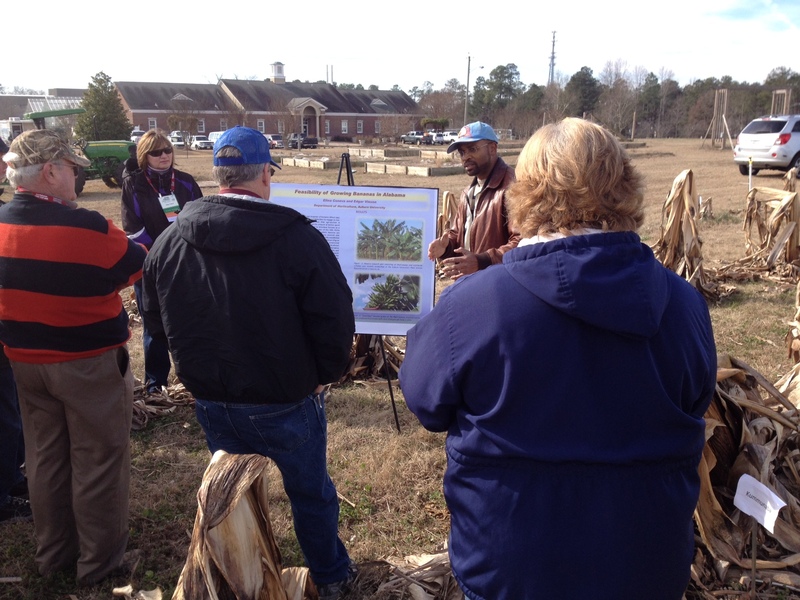 Catching up, I wanted to report about some intriguing research I stumbled across regarding growing bananas in the Coastal South, while attending the recent Alabama Fruit & Vegetable Growers Association Conference held at Auburn University. That’s right: Bananas. In Alabama. At Auburn. Is Auburn going bananas? It gets cold down South! The field trials are being held with hopes that local growers can provide a crop that competes with grocery imports. The trials are in their infancy; but so far 2 varieties survived last year’s 21- and 25-degree lows to harvest; they think at least one will survive this year’s 9-degree low; and this was in central Alabama, not the Coast. 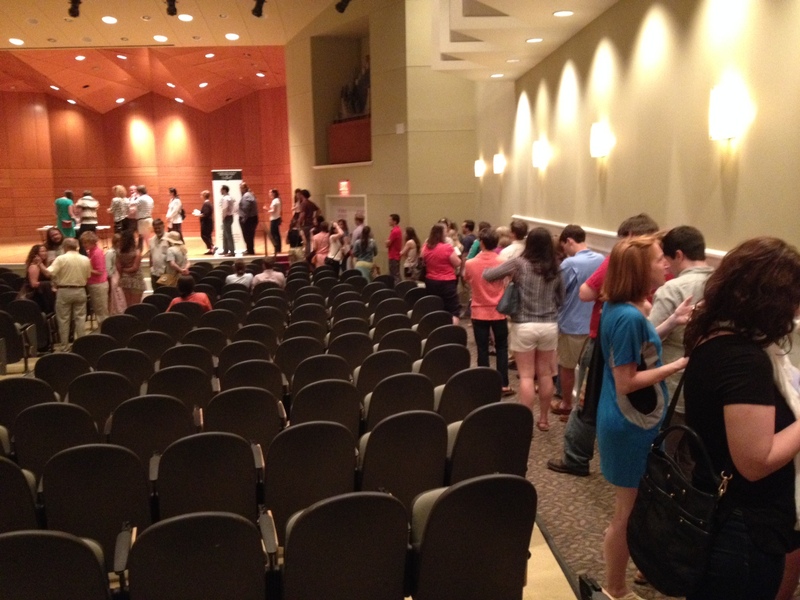 Trials are being held further south in Alabama, as well. 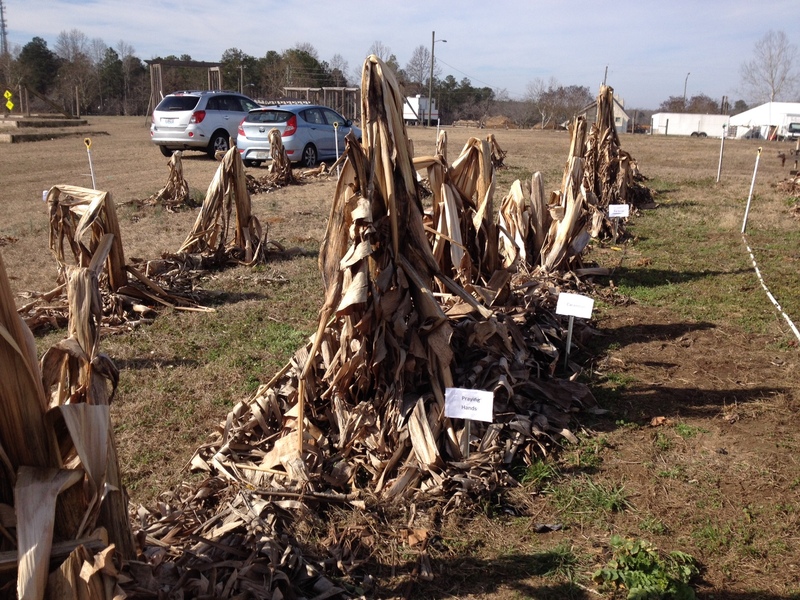 According to literature from the Alabama Cooperative Extension Service (ACES), the banana variety research plot at Auburn University’s Plant Science Research Center in Auburn, Ala., was established in 2011. Banana plants were provided by Dr. Greg Fonsah, an Extension ag economist and international banana production and marketing veteran from the University of Georgia at Tifton, GA. This research, in my opinion, offers a huge potential resource for local and sustainable growing in the South. As ACES reports, bananas offer many different products that small, local growers can produce. “The fresh fruit can be used as dessert. Banana fruit can be cooked, fried or eaten ripe with stew. They can be used to produce beer, livestock forage, cooking wraps and plates, can be utilized as shade trees and for medicinal purposes. Banana fruit has low fat, cholesterol, sodium and salt content, and is extremely rich in potassium.” And they can be used for ornamental purposes, too. But a major consideration for consumers interested in buying locally produced fruits and vegetables is that such locally grown products can be sustainably grown: not shipping them for thousands of miles and using up fossil fuels, or bringing up Fair Trade issues regarding worker health and equity. 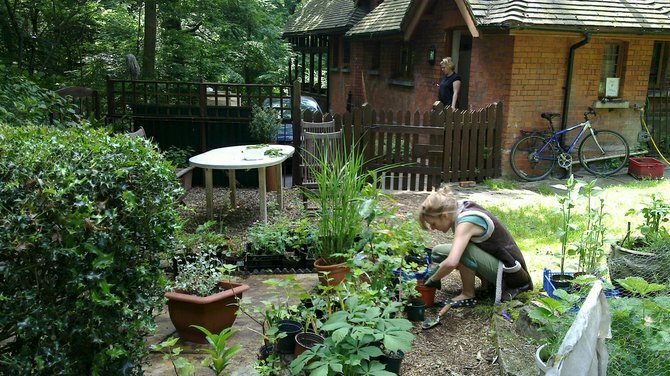 They can be grown as a local resource returning value to the local community. But I can say that I’m totally intrigued by the concept and hope that small, local and artisanal growers can add this crop to their offerings. Varieties being tested at Auburn: ‘Gold Finger’, ‘Saba’, ‘Dwarf Cavendish’, ‘Pisang Ceylon’, ‘Double, ‘Dwarf Green’, ‘Dwarf Red’, ‘Raja Puri’, ‘Grand Naine’, ‘Cardaba’, ‘Viente Cohol’, ‘Sweet Heart’, and ‘Ice Cream’. The tests will be carefully watched not only in Alabama, but across the Gulf States, I’m sure! 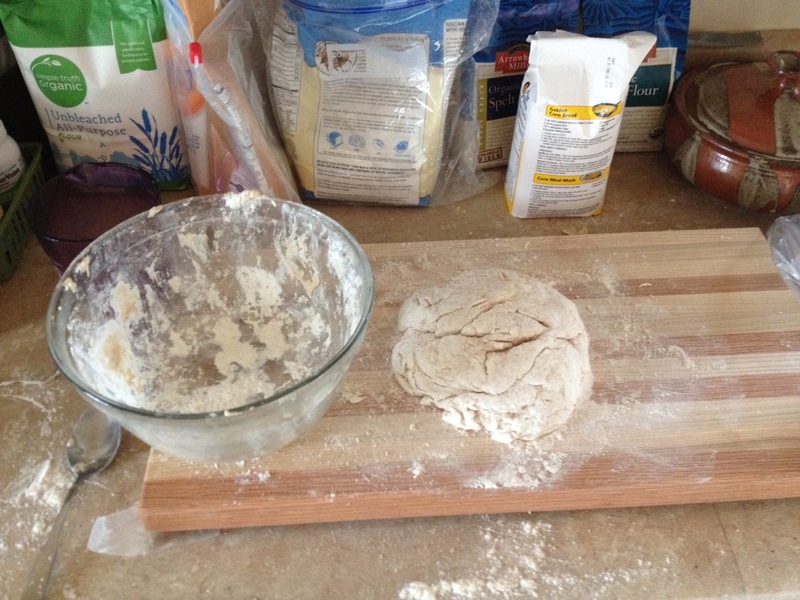 I’ve really been enjoying this first day of Daylight Savings Time, spending it in the kitchen, baking bread. 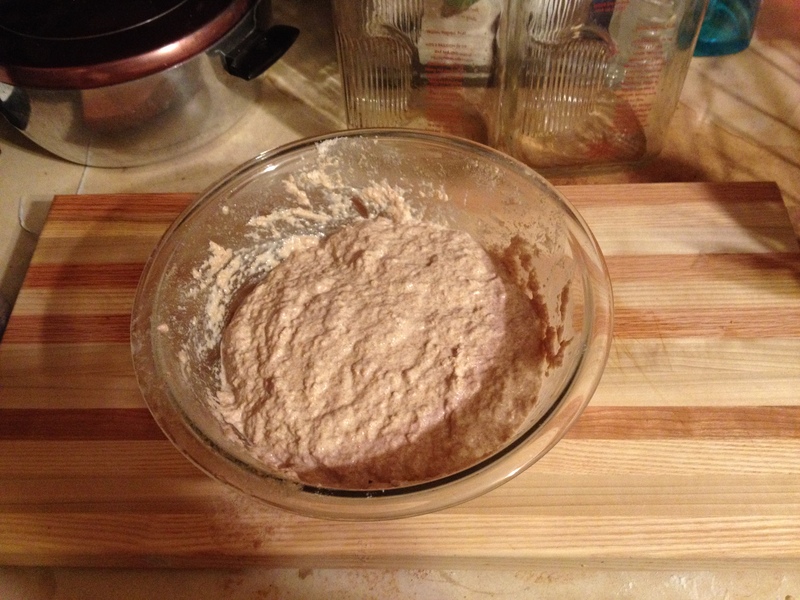 You know about my first loaf today: the no-knead sourdough bread (see previous post); but now I’m whipping up an organic white bread for my 16-month-old grand baby Nathan. Intelligent looking chap, isn’t he? 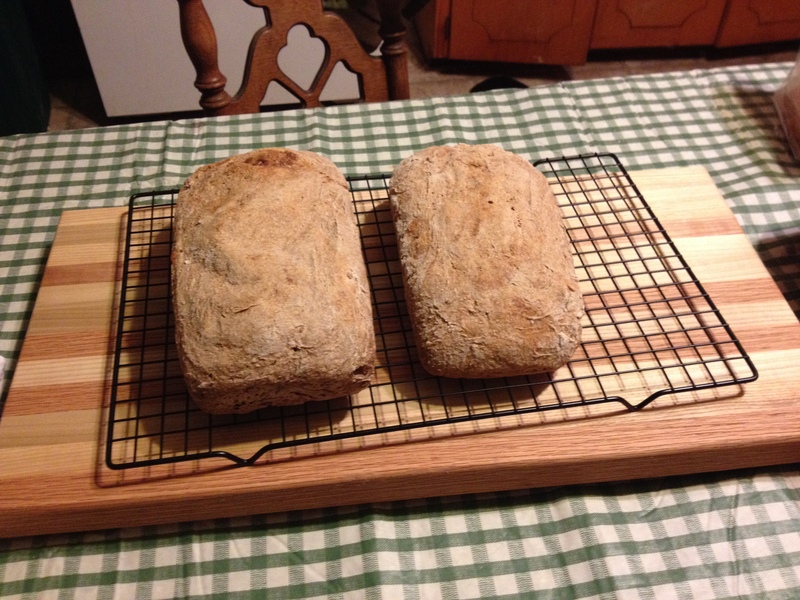 Some months back, my son Ross said that Nathan loved the white bread I made and hinted that it would be welcome to do a repeat. I’ve been busy since then, but thought that today, since I was in the kitchen anyway, why not? 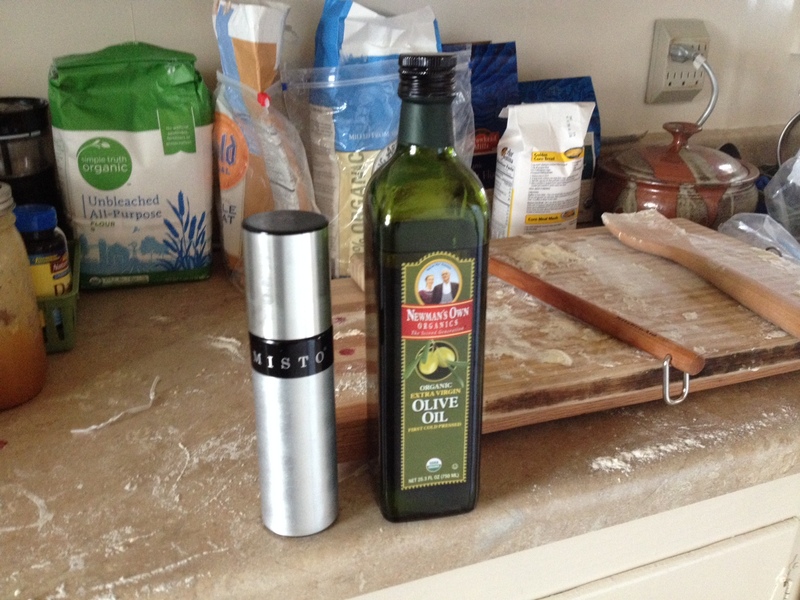 I will say that a couple of things seem to be helping; one is using a mister to apply olive oil. I found this one at Kroger and it works great. That way, I can lightly apply oil, like spraying Pam, but with a higher quality oil. Also, you can spray the bread slices with olive oil and eat them! 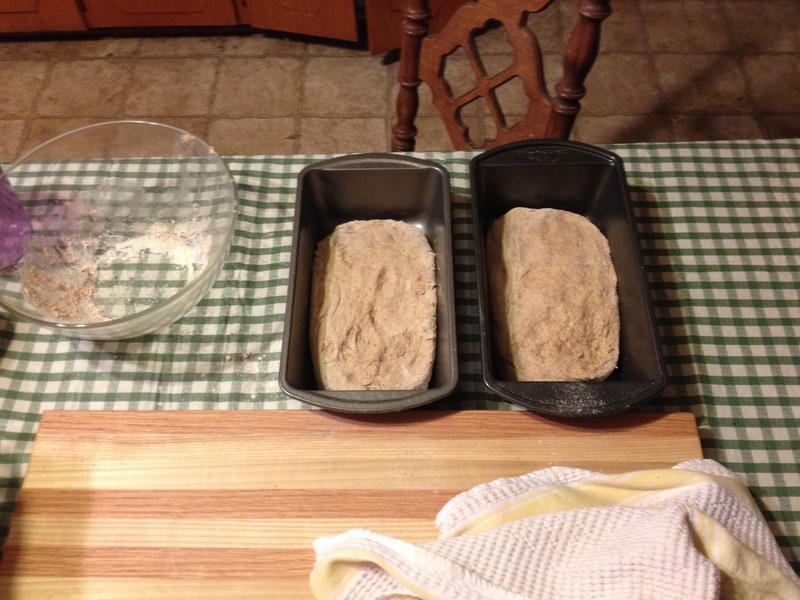 (Which I’ve been doing since I made the first loaf!) And for any salad you have, also. Nice gadget. Also, I actually clean the oven before I cook in it. 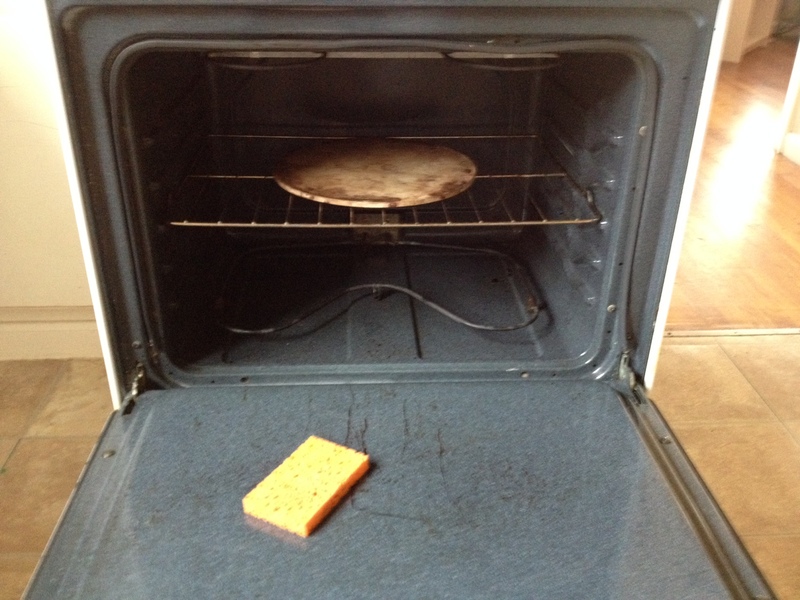 It doesn’t take but a moment to wipe it down and keep off gases from flavoring the bread. I also only use filtered water, to keep chlorine out (more important with kefir sourdough, maybe), and I use a cooking stone on the rack to give an even heat. I’m sure any veteran baker knows a lot more than I about all of this; these are only a few things I’ve found useful. 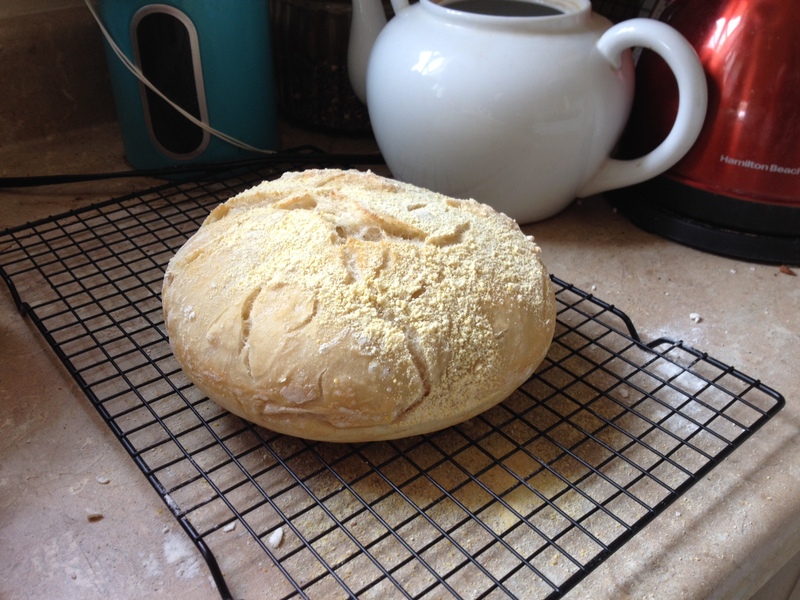 To be honest, I like making regular bread, as opposed to sourdough. Sourdough is a lot of work, and I manage to mess it up quite often. White bread is pretty easy, and quick. And I like the tactile experience of kneading the dough. It feels alive in your hands, very sensuous. Just mix it up, let it rise for about 30 minutes; then shape it and pop it in the oven. It’s been a great day! 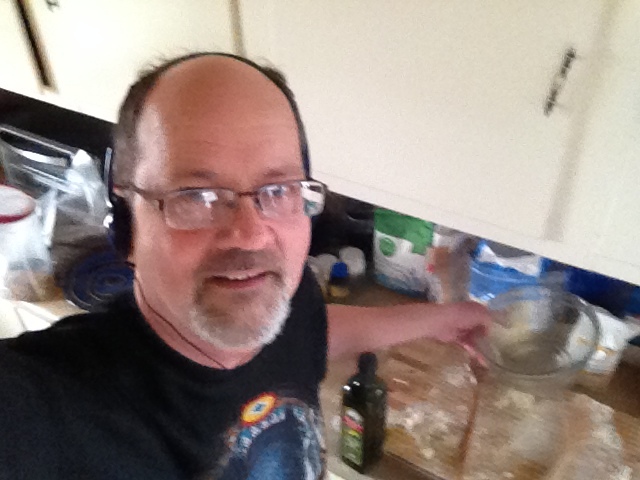 Puttering around in the kitchen, listening to The Splendid Table (“The Show for People Who Love to Eat!” http://www.splendidtable.org), and nibbling on homemade sourdough bread garnished with olive oil. And now, I have something good to give my grand baby! In my next book, I might explore the cooking aspect more, beyond growing an organic, natural and sustainable garden. It’s a lot cheaper and enjoyable than watching TV! 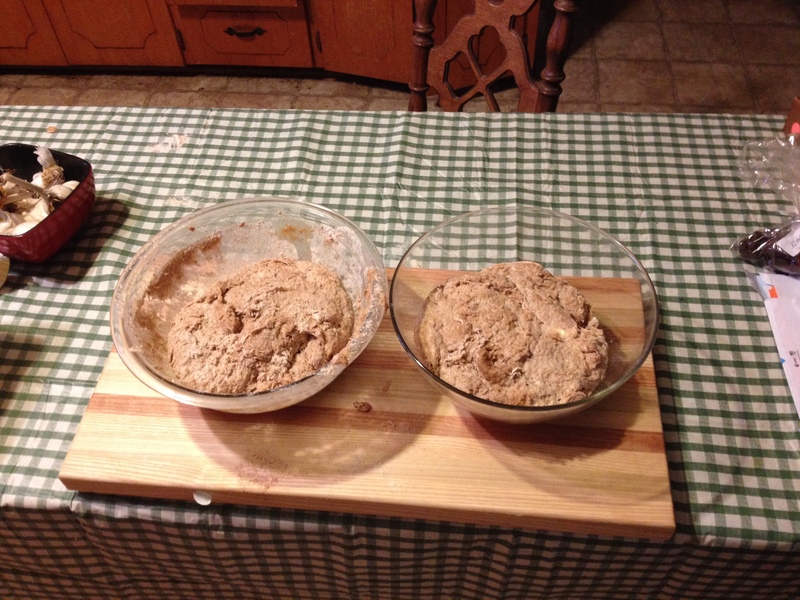 No-Knead Sourdough Bread Works Great! Regular readers of this blog know that I’m a rank amateur when it comes to kitchen matters. I can grow food well; it’s the cooking part that stumps me. But I’ve embraced my fears/inadequacies and have been embarking on a trail into the unknown: cooking from scratch. 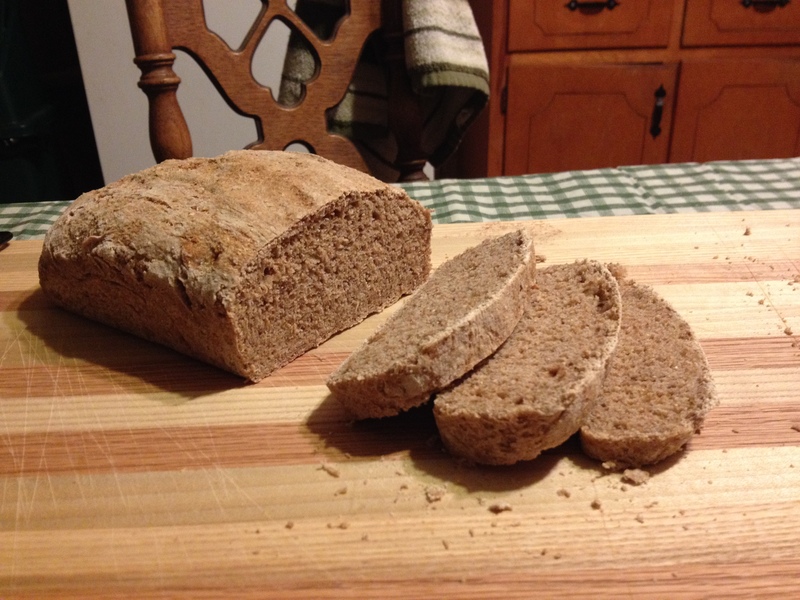 I think I’ve mastered making bread from scratch – or rather, I can make bread that I’m happy with, even if it maybe wouldn’t win any medals at the county fair. But sourdough bread – which I think is much more nutritious than regular bread (read previous blog entries) – has somewhat eluded me. Part of the problem I’ve been having, I think, is that I haven’t been feeding my starter enough, and I’ve kept it out. If I had fed it until it was robust, then put it in the refrigerator, that probably would have done better. 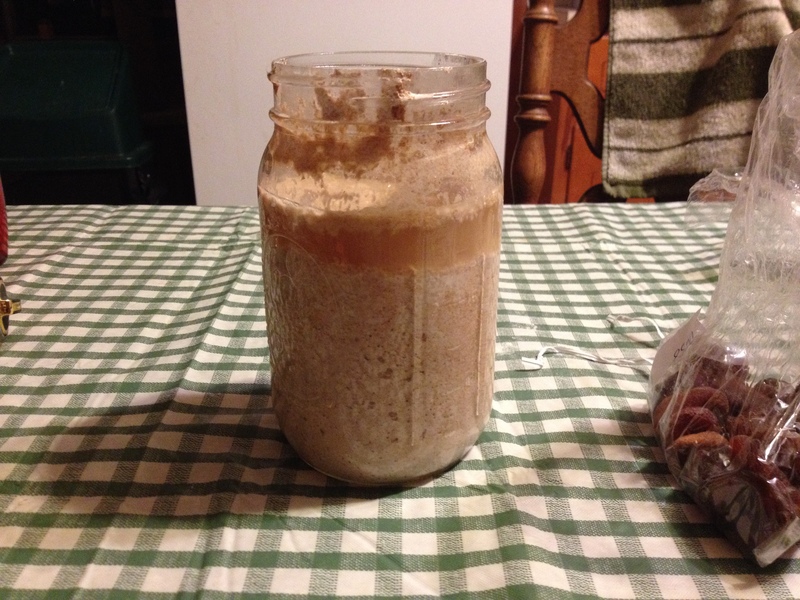 My old water kefir sourdough starter kind of went limp; so I threw it out and started another starter that I had ordered online – one meant for gluten-free grains. It started off OK, though I used regular organic all-purpose flour; but I left it out too long without feeding it enough and it developed mold. I researched what to do and was told that you can scrape off the mold and it will recover if you feed it enough. 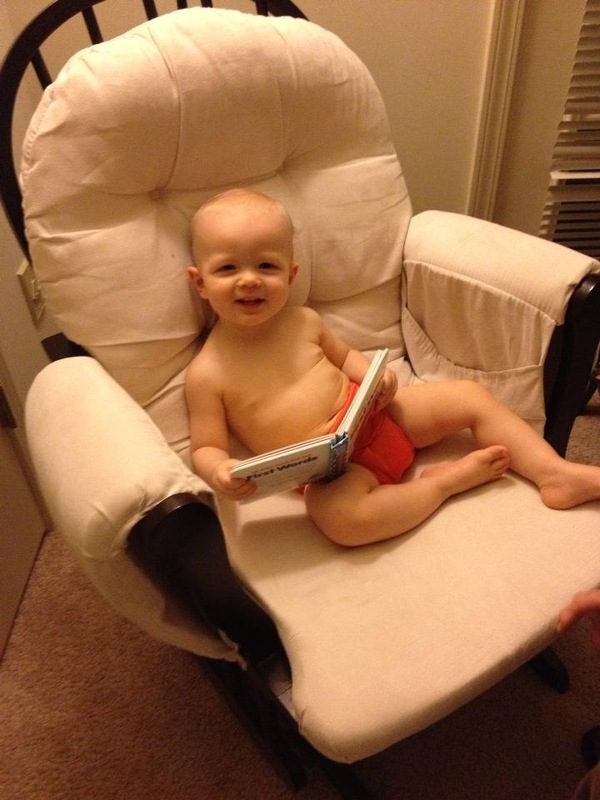 So, I did that — for a week …. scraping of mold, feeding it; scraping off mold, feeding it… Seemed like all I was doing was feeding the mold. So, I threw it out (into the flower bed, so it could return to earth). But when I came back inside, I noticed there was still a quarter inch of starter clinging to the bottom of the jar and it actually looked pretty good — bubbly — and smelled good — fruity. So, I thought, what the heck, and fed it with quarter cup of flour and quarter cup of filtered water. Well, it came back great guns! And it’s now fed and resting in the refrigerator. 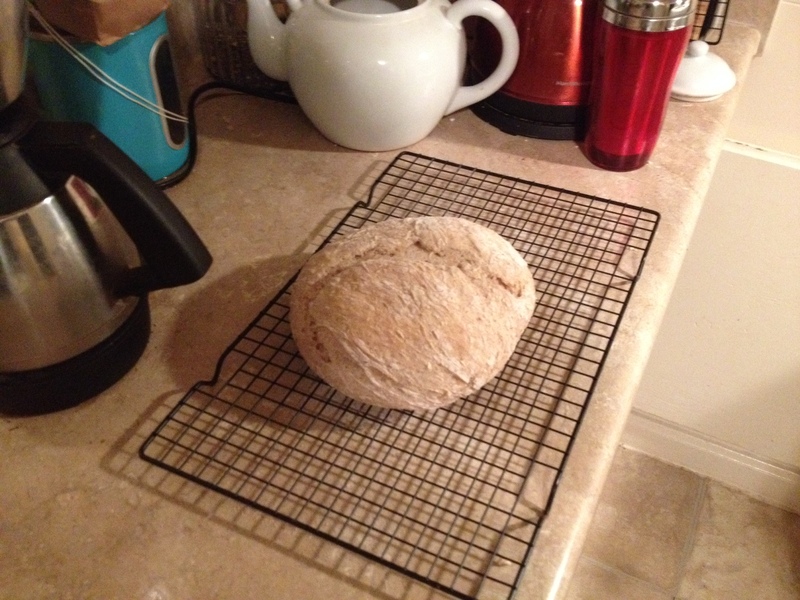 I’ll probably pull it out in a week or two (remembering to feed it once a week), and cook some bread with it. 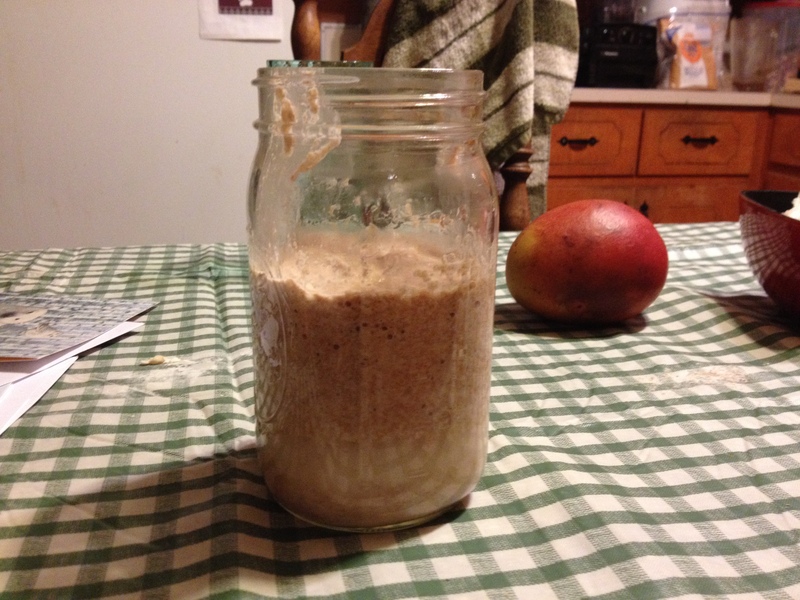 Meantime, I had started another batch of water kefir sourdough starter (see previous blogs). 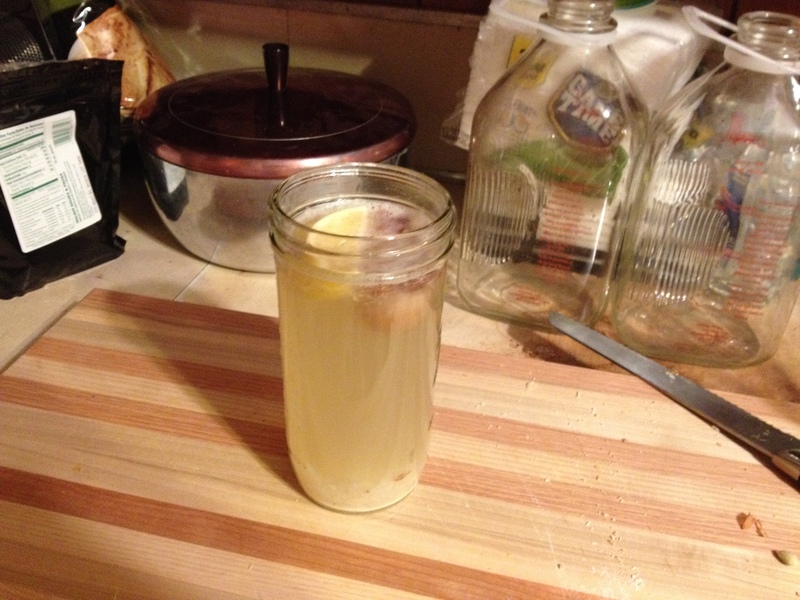 Since I keep water kefir going, I thought, why not? It’s free. So, I put two tablespoons of active water kefir with one-quarter cup of flour and quarter cup of filtered water and refed it with flour/water every 12 hours for a week. 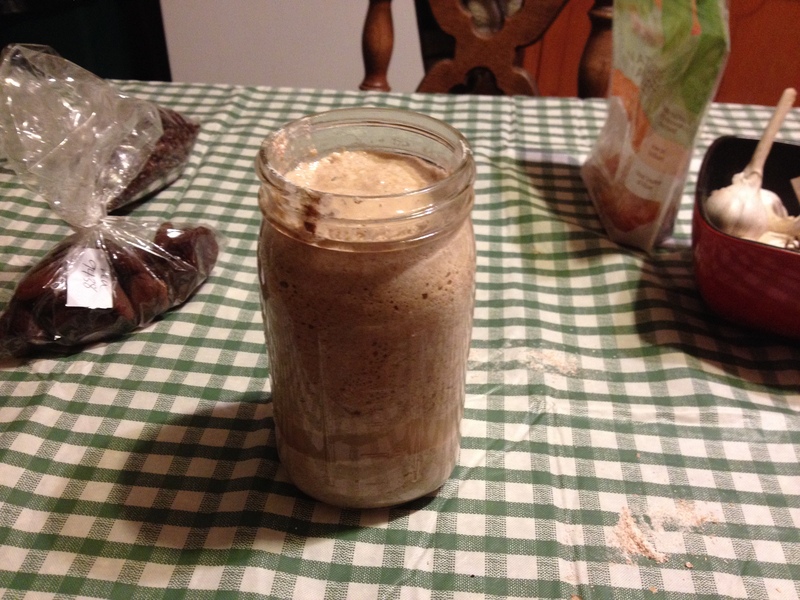 When the jar was full (Friday), I made my sponge and followed the recipe in Mother Earth News. I also went out and bought a three-and-a-half quart stainless steel dutch oven (stainless because I bake so much now, I get tired of scraping off dough that’s like concrete). And I bought a spritzer that holds olive oil that deposits a fine spray for cooking surfaces. That’s a big help, too. I’m way behind on keeping up with this blog on all the new things I’ve been seeing, learning and doing. I’ve been traveling so much – hardly two days in a row at home during the entire month of August – and September seems just as busy. So, I’m just going to throw random thoughts and observations in here, and they might not be in chronological order. To start, here’s photo of me taken Sunday speaking at the Farm Field Day that NCAT sponsored in Clay County, where I was speaking about the importance of sustainability in local food. 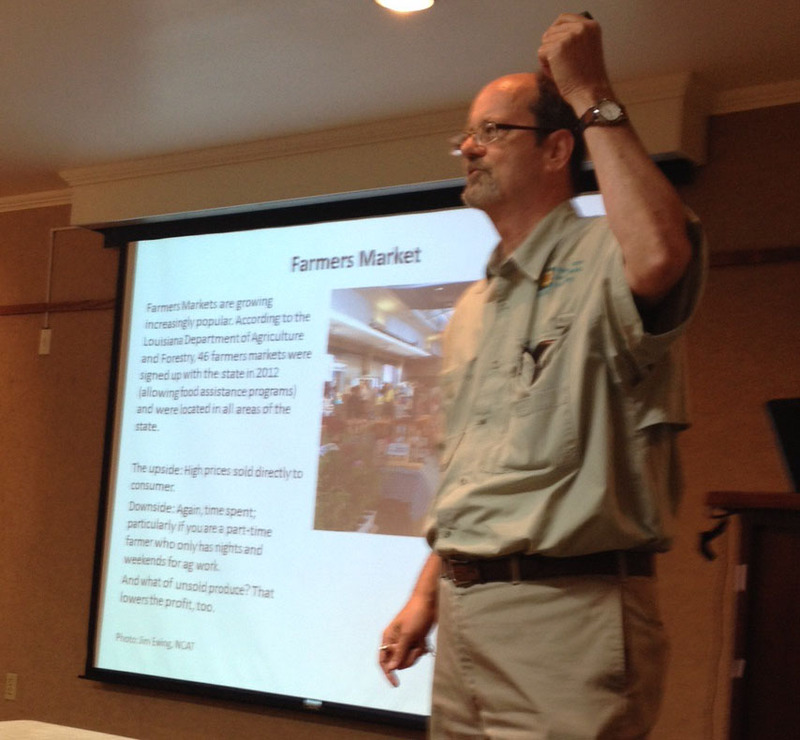 NCAT Outreach Coordinator Jim Ewing explains the importance of growing food sustainably and locally during a farm field day in Clay County, MS., Sept. 15, 2013. To cut to the chase, our Gulf States office of the National Center for Appropriate Technology (which operates the Sustainable Agriculture Information Service) and Gaining Ground – Sustainability Institute of Mississippi sponsored the field day to draw attention to a combined cattle/poultry/swine operation for its sustainable practices. About 70 people attended — lots of them young moms and dads with small children who are interested in buying locally grown food. It was my honor to be asked to explain to them how and why sustainably grown food is as important as it being locally grown food – to the environment, to the consumer, to the farmer. In this particular operation, the Clay County, Miss., farm of Johnny Wray, cattle, poultry and swine are used to improve the habitat and their own health by allowing each animal to do what it does best. Patterned on the model made popular by Virginia farmer/author Joel Salatin, their hogs are cleaning out overgrown areas of the farm by rooting through underbrush and uprooting saplings. The chickens are housed in chicken tractors which are flat cages that allow the chickens to range through grass after the steers have moved through. The cattle are “mob grazed” – kept in a bunch in approximately one acre paddocks, where they eat most of the grass offered. The chickens follow, eating the vegetation that the cattle don’t like and eating the bugs that are there, along with those drawn to the cow patties. What results is a flat, extremely fertile field that appears mowed like a golf course. From that, by naturally eradicating weeds, indigenous prairie grasses are exposed to sunlight and allowed to come forward in the pasture. So that, next time, after the field has been rested, the cows and chickens will have even denser forage that is even more nutritious. Instead of depleting natural resources, as “conventional” farming and grazing does, the rotational grazing of combined cattle and poultry improves the soil and forage as well as the health of the animals. That’s what is meant by a “sustainable” system. As owner Wray notes, he no longer has to apply fertilizer to his fields or cut hay from them to artificially supplement his cattle. He grows them grassfed and finishes them himself without having to send them to a feeder lot. Though he keeps the cattle longer, they sell for much higher than otherwise. Plus, since they are grassfed and not fed corn or treated with chemicals, he fetches a higher price from consumers who are don’t trust chemically or artificially raised animals. He says he has more orders for his grassfed beef than he has cattle. Wray is partnering in the cattle business with Elton Dean, a neighbor who is also a member of GGSIM’s Food Systems Committee. The operation is managed by Dustin Pinion and Ali Fratesi, who live in Starkville. Dustin apprenticed under Salatin in 2011 and is showcasing his talents in partnership with Wray and Dean.